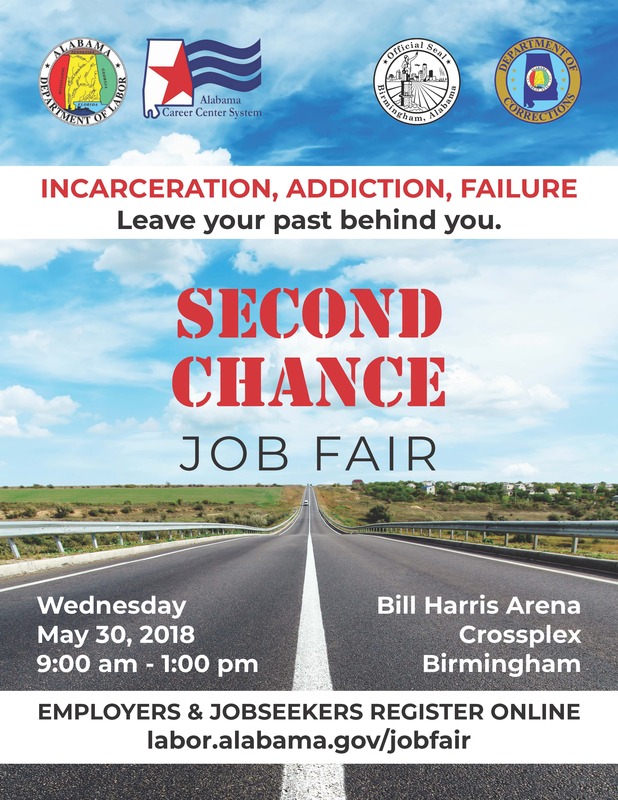 find work on Wednesday, May 30, 2018 from 9 a.m. to 1 p.m. at the Bill Harris Arena in Birmingham. addiction, those with little work history, and disadvantaged backgrounds, among others. Coming to the Job Fair.” More than 900 available jobs are represented. job fair or to save their confirmation e-mail on their phones. On-site registration will also be offered. The facility is accessible and buses and vans are welcome. "It is the job of our government to make sure all of our people have the opportunities and resources to thrive. those opportunities," said Mayor Woodfin. should be dressed professionally. Interview space will be provided. onsite at the job fair to assist jobseekers in applying for jobs. and Deon Wright, President, The Wright Way Company. 9 a.m. – 1 p.m.
*Press briefing at 8:30 a.m. Copyright © 2019 Alabama Department of Corrections All rights reserved.